Viasat Inc. (NASDAQ: VSAT) announced that the first ViaSat-3 payload module structure, built by Boeing, has arrived at their Tempe, Arizona facility — with the initial payload module structure now at the facility, Viasat can start payload integration and testing for the first ViaSat-3 class satellite that is scheduled to provide broadband service over the Americas, starting in 2020. 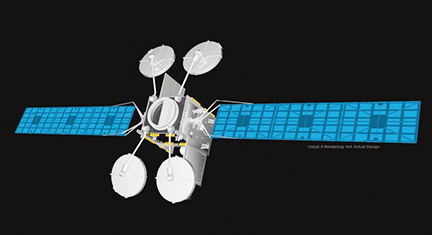 Viasat's tasks include building the ViaSat-3 satellite payload, integrating the payload into the Boeing-provided payload module structure and testing the integrated payload. Boeing will provide the scalable 702 satellite platform, spacecraft integration and environmental testing, launch vehicle integration and mission operations services. The ViaSat-3 class of Ka-band satellites is expected to provide unprecedented capabilities in terms of service speed and flexibility for a satellite platform. The first two satellites will focus on the Americas and on Europe, Middle East and Africa (EMEA), respectively, with a third satellite planned for the Asia Pacific region, completing Viasat's global service coverage. Each ViaSat-3 class satellite is expected to deliver more than 1-Terabit per second of network capacity, and to leverage high levels of flexibility to dynamically direct capacity to where customers are located. Dave Ryan, the President of Space Systems at Viasat said that the delivery of the first ViaSat-3 payload module structure marks a major milestone: the transition from the engineering and design phase to production on the company's first ViaSat-3 class satellite. This achievement brings ViaSat one step closer to delivering the future of affordable, accessible satellite broadband services, anywhere. Chris Johnson, President of Boeing Satellite Systems International, added that the Viasat and Boeing teams continue to push the boundaries in design and construction of a satellite. In addition to having just delivered on the first payload module structure, the firm is currently working on building the second ViaSat-3 payload module structure, which will help Viasat meet their global ambition of bringing satellite broadband internet to the world.